Six Mile Creek in Pickens County – also spelled Sixmile Creek – is more powerful than it looks in this serene image. The Six Mile Creek Shoals once supplied energy for Puckett Mill – later called Kay Mill – and was the site of the first electric power generator for the adjacent community of Six Mile. Class I rapids make up most of the two-mile stretch from Jones Mill Road to Lake Issaqueena where the creek drains, but a Class II rapid known as First Ledge followed by a Class III rapid called Six Mile Slide entice experienced kayakers. 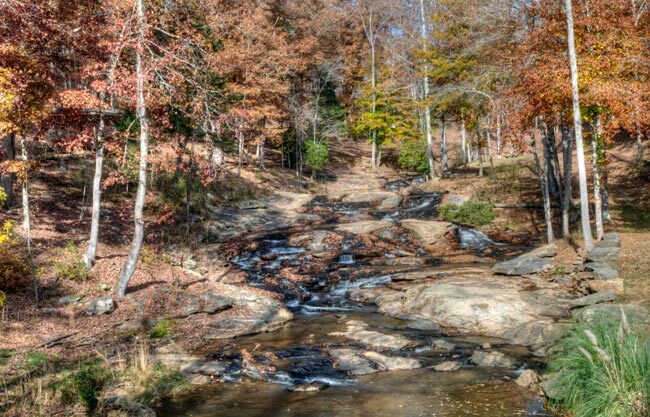 The portion of the creek near Lake Issaqueena abuts Clemson University and is owned by the school as part of the 17,500-acre Clemson Experimental Forest. The outdoor classroom consists of second-growth forests which have grown over cotton fields cleared in the early twentieth century. The surrounding area includes Six Mile Creek Trail and is open to the public as an educational arboretum. Hi, Melissa! The photo is from Steven Faucette, and if you click on his name under the photo, it should take you to his website. Hopefully, you can find a way to contact him for the photo. Best of luck! Hello, the picture of Pickens County are stunning. I am with Seth Crow – State Farm Insurance in Liberty. Would it be possible for us to use some of your photos on our FB page? We would credit you, of course. Thank you in advance for any consideration!